Living in the city is definitely carrying a lot of stress no matter from work or just by living under the busy speed. For me, i would bring some colors or styles in my daily life that make my every single day prettier or maybe easier. Around the heart of this business city. How would you like to make your office alive or get a way to increase your output of a day? As a fashion stylist. The style of the day is almost more important than a wonderful breakfast!! which is my support of the day as well as the emotion control. Here we go, my smart casual style for another working day in the office. Easy Breezy matching black and white for the formalist. Plus a pair of red carpet high heels to kill the blues also to catch the spotlight. At the same time, the devil red is the eye catching point of the look. 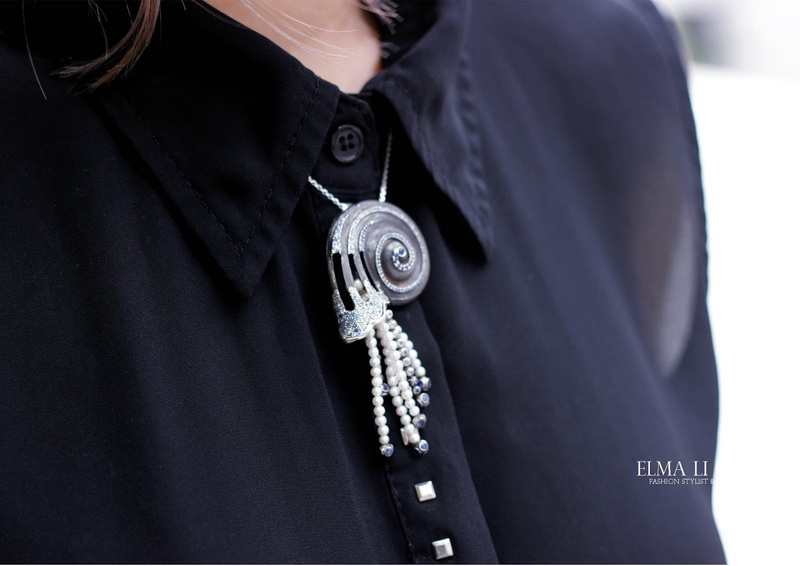 I would suggest you to go with some accessories in same color or pick the color red lipstick or nail polish to kick the traditional B & W.
Last but not least, a bit of contrast to make more fun of the day such as the sapphire seashell necklace. A natural balance of the cheesy look! Little tips: Cosmoparis has landed to Hong Kong already in Pacific place! Act now to check out the leisure Parisian style.